A grim drama about life and loss, The Hustler is extraordinarily bleak. The story of pool shark Eddie Felson discovering himself in a bottom-feeding world offers pessimism layered with hopelessness, Eddie consigned to finding empty victories only when people he cares about lose badly, in a net-zero game. "Fast" Eddie Felson (Paul Newman) is an expert pool hustler, scouring scuzzy pool halls in small towns with his partner Charlie (Myron McCormick), duping other players out of small money. 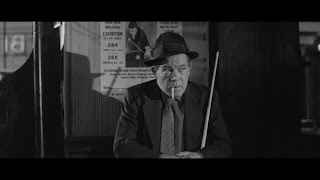 Determined to prove that he is the best, Eddie arrives in the town of Ames to take on the legendary Minnesota Fats (Jackie Gleason), an undefeated master at pool. 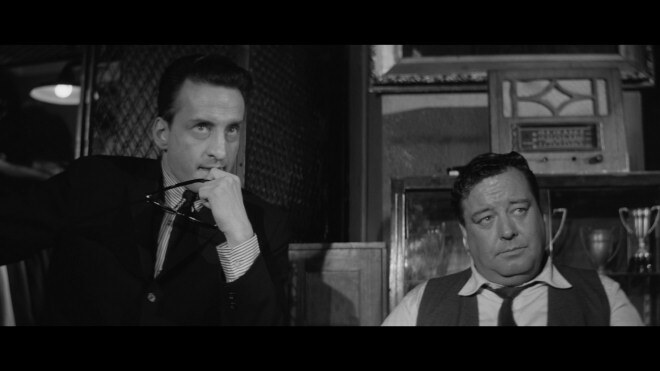 In a marathon 25 hour duel watched by expert gambler Bert Gordon (George C. Scott), and despite initially building a huge lead, Eddie fails to control his drinking and is soundly defeated. Bert: Eddie, you're a born loser. Eddie: What's that supposed to mean? Bert: First time in ten years I ever saw Minnesota Fats hooked... really hooked. But you let him off. Eddie: I told you I got drunk. Bert: Sure you got drunk. You have the best excuse in the world for losing; no trouble losing when you got a good excuse. Winning... that can be heavy on your back, too, like a monkey. You'll drop that load too when you got an excuse. All you gotta do is learn to feel sorry for yourself. One of the best indoor sports, feeling sorry for yourself. A sport enjoyed by all, especially the born losers. Eddie: Thanks for the drink. Depressed, Eddie abandons Charlie and shacks up with Sarah Packard (Piper Laurie), a lonely woman he picks up at the bus station. Sarah walks with a limp and claims to be a "college student", but her behaviour suggests other pursuits. Regardless, she falls deeply in love with Eddie. Meanwhile, Bert approaches Eddie and offers to manage him in return for a huge cut of Eddie's winnings. With an eye on securing a rematch with Minnesota Fats, Eddie reluctantly agrees, but becoming a winner will come at a cost. Eddie (to Bert): Maybe I'm not such a high-class piece of property right now. But that twenty-five percent slice of somethin' big is better than a hundred percent slice of nothin'. The Hustler is a tragedy where victories are shallow and fleeting, and losses are devastating and leave permanent psychological scars. Four characters surround Eddie Felson, and his destiny is intertwined with theirs. Charlie is his small-time partner, satisfied with modest victories and often providing an ignored voice of reason. Minnesota Fats is the theoretical standard that Eddie measures himself against, an undefeated gentleman legend who has to be bested if Felson is to live up to his own hype as the world's best. Sarah is Eddie's potential soul mate, a woman as damaged as he is and who quickly learns to love him unconditionally. And Bert represents the win-at-all-costs dark side, a man willing to fine-tune the faults out of Eddie's game and turn him into a soulless winning machine. 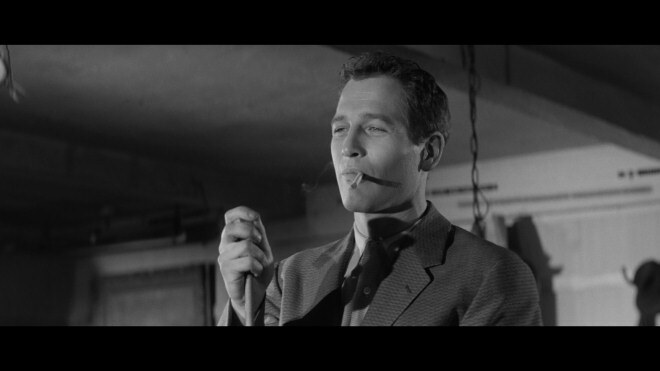 Paul Newman gives one of his career-defining performances as Eddie Felson, a man battling his inner demons just as much as his pool table opponents. Abrupt with Charlie, taking full advantage of Sarah, and using Bert to climb back out of the sewer, Eddie will eventually become aware of the human misery in his wake, but not before most of the damage is done. 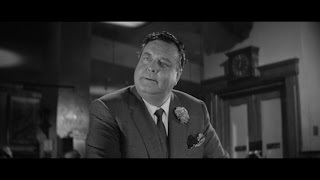 George C. Scott, Piper Laurie, Jackie Gleason and Myron McCormick lend unforgettable support, while Murray Hamilton gets a small but effective role as the rich target of Eddie's first collaboration with Bert. Newman, Gleason, Scott and Laurie all received Academy Award acting nominations. 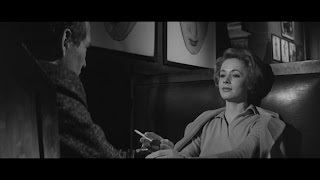 Filmed entirely in New York, and in austere black and white befitting the unforgiving world of desperate men gambling through a smoky haze, The Hustler is an enthralling classic. Director Robert Rossen also co-wrote the screenplay, and is most interested in the many different ways that men find to spectacularly fail at life. Cocky, dismissive, cold-hearted, insulting, selfish, disingenuous and dishonest, Eddie will find all the different paths to misery, some on his own and others with Bert's help. By the time he achieves what he thought he was after, his life echoes within the vacuum of a deserted soul, and worst of all, he realizes it. Eddie's ups and downs have a ripple effect, and often the most unintended but predictable outcomes. In an agonizing downward spiral, Eddie will find that any success that he achieves will come at the expense of his inner circle, that there is no pleasure to be had when a personal win only comes tightly packaged with an intimate loss. Eddie: Fat man, you shoot a great game of pool. The Hustler charges to a spectacular Pyrrhic victory, a win at a pool table psychologically surrounded by a clutch of victims, none of them able to applaud.